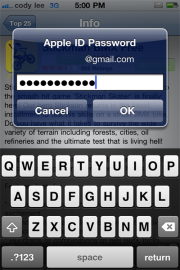 Apple is making it easier to get apps from the App Store with iOS 6 by removing the need to enter your password for every app you download to your device, according to numerous online reports. If all you’re doing is downloading an app update, a free app, or an app you previously deleted, Apple reportedly will not ask for your password in its next update to its' mobile OS for the iPad, iPhone, and iPod Touch. Instead, you will only have to enter your password for paid apps. The change was first publicized by a Reddit user with access to the latest beta version of iOS 6 released to developers.